How many of you have had an Australian whisky? For me this is my first. I have heard about them, but not great things so I purchased this bottle with some trepidation (but then I am up for anything and willing to risk a full bottle). Am I surprised by the results? Yes. Will I buy another bottle? At some stage in the future. This is not because I do not enjoy it nor appreciate it, but rather it is not to my general liking. Basically I miss the salt and peat. So what did I buy? A bit of history. Made by the Great Southern Distilling Company in Albany Western Australia, it is currently as far as I am aware the only Western Australian whisky distillery. Apparently they too have peat! Yes, I heard that Tasmania has something of the kind but never heard of it on the mainland (there are many things I do not know if you have not guessed). It took me a while to find the flavour. What can I say? Fresh figs baked with sweet sherry and brown sugar topped with fresh cream. Sounds specific but I assure you this is it (at least to my taste buds). For the D.T.W.C members if I can get my hands on another bottle I will be sure to serve up a dish of fresh baked figs with a dram of Limeburners just to show you how close this is. On the nose: clearly fig and sherry. Very little burn of alcohol making it very enticing and a light cereal sweetness. To taste: much more cereal notes and caramel on the pallet. Lot's of creaminess and silk around the mouth making it quite easy to swallow. Now the alcohol starts to burn a little which is a bit unexpected based on the nose. The finish is quite long, especially in the chest, with a nice warming effect. It is lost in the throat very quickly and does not run up through the nose like some other whiskys. Rather it seems to stay in the mouth around the cheeks and front of the tongue. The sweet sherry seems to linger most enjoyably, which draws you to another sip. The lips continue to burn well after the heat leaves the chest. Yes you could keep on drinking this expression all night...but if I was to have a bottle of Talisker 10yo or even the a Glenlivet 12yo on the table, then I would be sliding the Limeburners aside almost immediately. 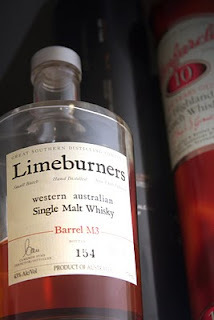 Currently the Limeburners website is pushing this expression at A$200 a bottle. I paid A$70. Do I think it is worth the purchase price? No not really. Even at A$70 a bottle this is a way over priced for it's contents and truly your just paying the price for the limited release. If you were buying for a collection then yes, for $70 this is a bargain. I can understand limited release, and expenses in initial start ups but when there is so much on the market one has to consider a relative price comparison. For an Australian whisky I would have expected more and wanted to find the flavours and smells of Australian woods (such as Red Cedar, Eucalyptus or Pine). For anyone from Australia, think of being in front of an open fire, having a wood fired BBQ, or even walking through a saw mill and you probably know what I mean. For me it is a real pity that I am not finding any of this and I am sure the barley could easily be influenced by our woods during the roasting process. Hell maybe it is and I just don't get it, but reading on the Limeburners website they make note about wanting to achieve the things they liked most about their favourite Scotch Whiskies. To me if I wanted Scotch Whisky, then I would by a Scotch Whisky. In the end I still applaud the effort and really do look forward to later releases and expressions as the production ramps up. If I am ever in Western Australia I will be sure to stop in at the distillery. If I gave a dram I would give it 5 out of 7. A nice effort, and not an effort at all to drink. I believe we had a comment a while ago from a chap over in WA. If your reading and you have had the Limeburners, been to the distillery, or have any comments give us a shout out.